from left: "paradox," "cubine," "lacey," "knight's bridge" & "stircles"
This was beyond doodling actually. I took my first zentangle class tonight and it was just what I hoped it would be- yoga for my brain! 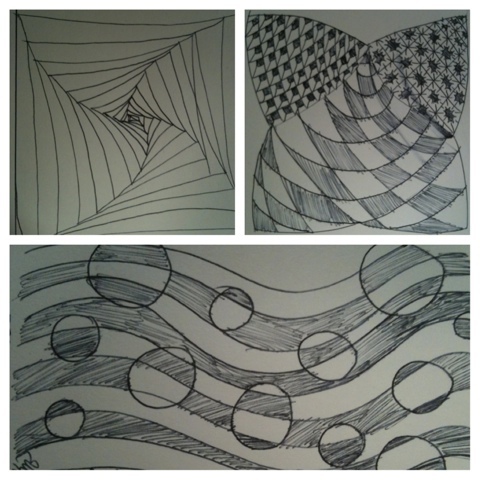 Zentangles are miniature works of art in black and white. They are abstract, but are created through a structured method of repetitive patterns. Besides being fun and totally accessible to anyone, zentangle is best known for its therapeutic benefits. This art form has been used to treat anxiety, addiction, attention disorders and is even said to help with pain management. Within moments, I found myself in a relaxed meditative state as I became totally absorbed in creating patterns. As I made repeated, deliberate strokes I could feel my focus and concentration improve on the task at hand. I was completely in the moment! What a great way to temporarily silence the storm that is my busy mind. Official zentangles call for some fine art tools: 3.5" square tiles cut from fancy Fabriano paper, micron pens, graphite pencil and shader. I might pick up some pens for smoother strokes and easier filling, but a regular sketchbook will serve my purposes. Notice erasers aren't on the list. A pencil is used only to create the original "frame" and "strings" to provide grids for tangling. The "patterns" are all done in permanent pen. How's that for a lesson in accepting mistakes and moving ahead? I can tell you from tonight's experience, my eagerness to finish a tangle resulted in several incorrect strokes, but once you're into a tangle, you might as well finish it. Mistakes or "variations," as the teacher called them, add to the charm. Releasing expectations is part of the zentangle art philosophy. I'll take all the practice I can in the area of putting process over product! To learn more about the origin and philosophy behind zentangles, check out the official zentangle site. For pattern ideas and to see how the pros do it, visit tanglepatterns.com. The zentangle slogan is going to be my new art mantra: "Anything is possible, one stroke at a time."